In many sports, predicting the passing behavior of players is desirable at it provides insights that can help to understand and improve player performance. 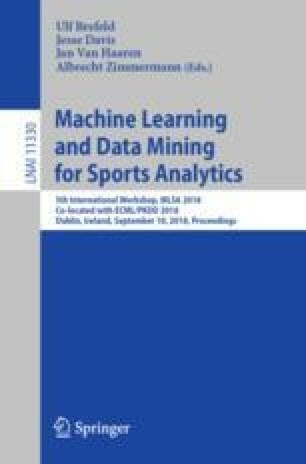 In this paper, we describe a novel model for football pass prediction, developed to participate in the Prediction Challenge of the 5th Workshop on Machine Learning and Data Mining for Sports Analytics, collocated with ECML PAKDD 2018. The model called Football Pass Predictor (FPP) considers various aspects to generate predictions such as the distance between players, the proximity of players from the opposite team, and the direction of each pass. Experimental results shows that the model can achieve a prediction accuracy of 33.8%, and more than 50% if two guesses are allowed. This is considerably more than the random predictor, which obtains 8.3%. This work is partially financed by the Youth 1000 talent funding of Philippe Fournier-Viger.